Umbilical granuloma presents as soft pedunculated fleshy lesion after the separation of umbilical cord. Silver nitrate has been used for the treatment of umbilical granuloma. We present a case of 15 days old infant where the technique of application was innovated to maximize the results and minimize the chances of burns associated with application of silver nitrate. A 15 days old infant was brought with the complaints of an oozing mass over the umbilical area since the separation of umbilical cord. The infant was born with normal vaginal delivery without any complications. On physical examination a single flesh colored moist pedunculated lesion was present over the umbilicus. There was no evidence of blood or pus discharge from the lesion. Rest of the cutaneous, mucosal and systemic examination was normal. No treatment for the lesion was initiated in the past. A diagnosis of umbilical granuloma was made based on the history and clinical examination. Chemical cauterization of the umbilical granuloma was planned with silver nitrate. Silver nitrate pencil sticks (1%) are available in a dark colored plastic wraps to prevent it from light exposure and moisture (Figure 1). A portion of this stick (1 gm) was crushed into fine powder (Figure 2a). A paste was made by adding few drops of distilled water which can be promptly applied by a cotton tip applicator to the umbilical granuloma (Figure 2b). The surrounding skin was rinsed/cleaned with normal saline (Figure 3a). This procedure was repeated twice weekly till the scab fell off (Figure 3b). 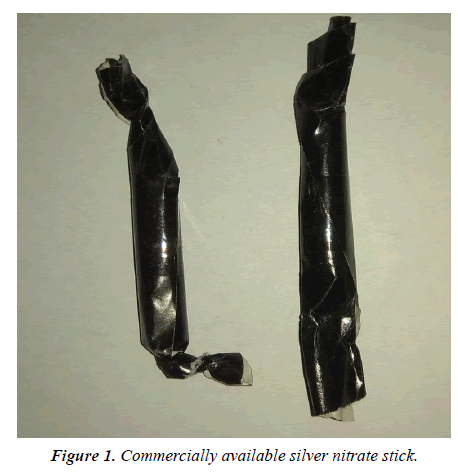 Figure 1: Commercially available silver nitrate stick. 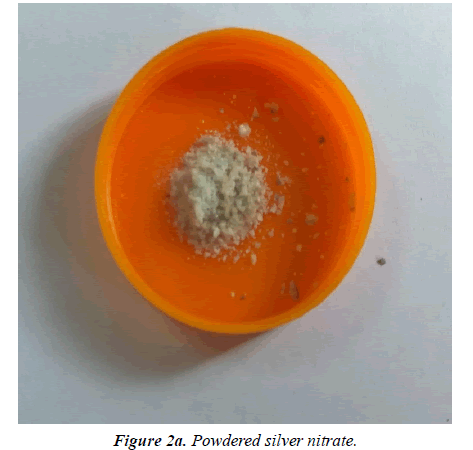 Figure 2a: Powdered silver nitrate. 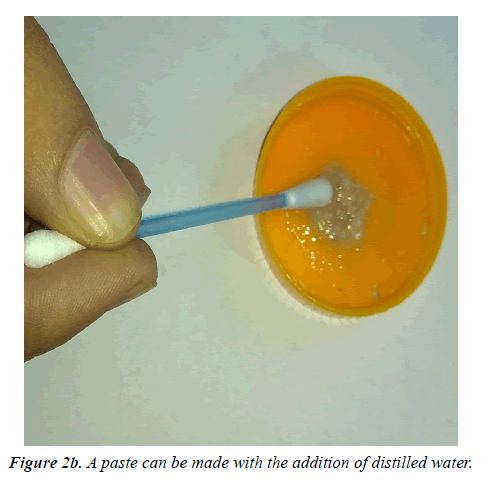 Figure 2b: A paste can be made with the addition of distilled water. 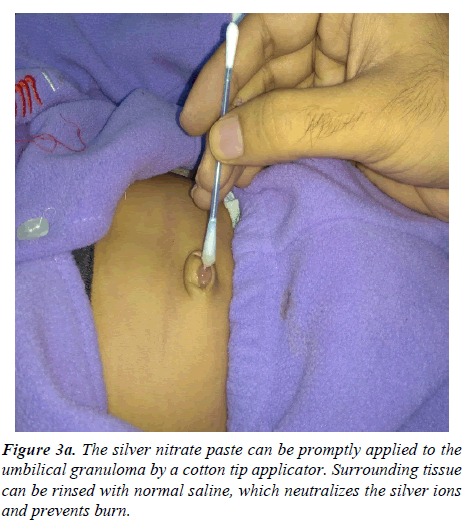 Figure 3a: The silver nitrate paste can be promptly applied to the umbilical granuloma by a cotton tip applicator. Surrounding tissue can be rinsed with normal saline, which neutralizes the silver ions and prevents burn. Figure 3b: Black eschar 24 hours after application of silver nitrate. Umbilical granuloma is a common presentation in neonates which appears after the umbilical cord separation. It presents as a moist, soft pedunculated fleshy lesion. Silver nitrate is a white crystalline solid which is light and temperature sensitive and has good solubility in distilled water . It is used in medicine as an antiseptic, hemostatic and cauterizing agent. In presence of moisture it disintegrates into Ag+ ions which are responsible for its medicinal properties [1-3]. It is commonly available as pencil sticks (1%) in India. The Q tip applicator (75% silver nitrate and 25% potassium nitrate) used in western countries is not available in India . Direct application of pencil sticks to the moist umbilical granuloma converts only a small amount of silver nitrate into Ag+ ions and thus fails to produce desirable results. On the other hand, overzealous application can result in burns since silver nitrate is a highly caustic material [2,3]. We have modified the technique of application of silver nitrate to achieve desirable results. The addition of distilled water to the powdered silver nitrate allows pre-activation of silver nitrate into Ag+ ions thus enabling its cauterizing and antiseptic effect. The pre-activation allows silver nitrate to act faster as compared to the standard technique of application of silver nitrate stick directly to the lesion. The surrounding skin was rinsed/cleaned with normal saline which neutralizes the silver nitrate, thus preventing surrounding burn. Rinsing with normal saline is superior to the standard technique of application of vaseline in the surrounding. This is because in presence of NaCl, The silver ions get inactivated. It is of utmost importance not to rinse the affected area with normal saline prior to the procedure. This simple yet effective method not only simplifies the ease of application but also prevents post application burns. The results achieved are safe and encouraging. 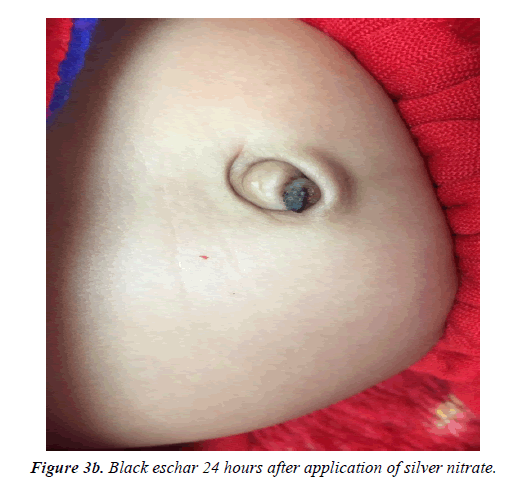 The purpose of this case report was to sensitize the clinicians with this safe and effective new technique of application of silver nitrate for umbilical granuloma. Silver nitrate CID 24470. PubChem open chemistry database. National center for biotechnology information 2017. Karagüzel G, Aldemir H. Umbilical granuloma: Modern understanding of etiopathogenesis, diagnosis, and management. J Pediatr Neonatal Care 2016; 4: 1-5. Chamberlain JM, Gorman RL, Young GM. Silver nitrate burns following treatment for umbilical granuloma. Pediatr Emerg Care 1992; 8: 29-30.